The City of Toowoomba in Queensland, Australia is famous for a few things. Located in the Northeast of Australia, it’s only a short drive to the ocean, and sits close to the Great Barrier Reef. But people don’t come to Toowoomba for its proximity to beaches and natural wonders, they come for the scenery. Toowoomba is nicknamed “The Garden City” for good reason: it boasts over 150 parks inside its small borders, and the city’s 150,000 residents are constantly surrounded by the natural beauty of the region, which is made in part by its geography and soil. Rich volcanic ash feeds the city’s many Jacaranda, camphor laurel and plane trees that line many of the city streets, giving the city a rich green colour, but many people plant flowers and other colourful plants, which are judged as part of the city’s annual Australian Carnival of Flowers held every September. But natural beauty is just one of the reasons people are flocking to Toowoomba, and the Carnival of Flowers isn’t the only festival that celebrates colour and life. The other is Toowoomba’s First Coat Mural Festival, an annual three-day festival that celebrates street art and entertainment. 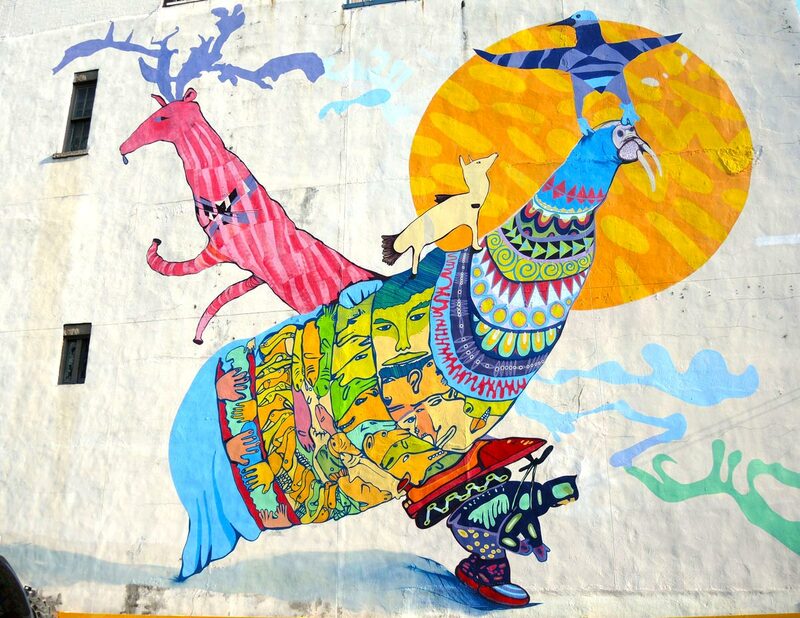 The festival brings together thousands of street artists, muralists, and other performers from around the world, all eager to show off what makes them special. Aspiring artists can also take full advantage of the festival’s many events, which range from discussions to masterclasses on various art techniques and styles. Most of these events are also free, and almost all are hosted in Queensland’s largest open air gallery at the heart of Toowoomba. But more than a festival, First Coat is a clever way to deal with unwanted graffiti and put up some beautiful street art at the same time. Since the city and surrounding area enjoys a healthy tourism industry based on its beauty, the entire area tries to be prudent when it comes to graffiti and unwanted “additions” to the landscape. But, of course, the city has its fair share of overeager and aspiring street artists who don’t always comply with regulation, and the annual festival helps the city cover up unwanted tags and graffiti. The move, besides being a great way to promote murals and street art, is also a pragmatic choice. On top of bringing in an estimated $90,000 in extra revenue this past May, the festival also helped eliminate an estimated $45,000 in graffiti cleanup, all by encouraging art. First Coat is an example of street art at its absolute best: encouraging great artists, collaboration, and helping change the public’s opinion about public art and street art in general. It proves, year after year, that public art is an important part of a city’s identity, not just for its own artistic merit, but because it can help beautify even the most gorgeous of cities. And because such a festival brings together artists from all around the world, and encourages people of all skill levels to learn and develop together, it strengthens the global muralist community. Those are all good things. The world of graffiti has often focused on pictures over words, and that has caused an important part of the industry to die away. The art of graffiti writing is rarely seen beyond tags these days, or as complementary pieces to pictures and murals. But for one Danish street artist, the art of graffiti writing is more than declaring your graduation year. It’s about harnassing something different in the artform and bringing it to the forefront again. Soten thinks, graffiti should be free for anyone to do, and people who want to keep the movement attached to its illegal routes aren’t helping the industry or the artistry. They are, according to Soten, holding the entire medium back. But Soten’s more than just a political figure for the street art scene in Copenhagen, he’s also a talented graffiti writer who’s travelled the world doing art for all kinds of projects. His writing ranges from scrawls to full 3-dimensional experiences, and they’re probably best described as traditionalist with a hint of the contemporary. Soten’s style is obviously influenced by the brighter colours and effects of the L.A. scene, but he also infuses it with a more recent English minimalism in much of his quieter work. Soten’s distinct style and love of writing shows a marked change from the usual picture-focused mural work that happens in today’s climate. But that doesn’t mean graffiti writing is inferior, and artists like Soten are proving that everyday. His work reminds us that there is much about street art that’s still misunderstood, and artists need to preserve and forward the more obscure aspects of the craft to renew enthusiasm and keeping the artistry alive.